Many people think that they will wait to list their home for sale until 'after the holidays'. After all, no one is looking for a home during the period of time between Thanksgiving and New Year's. The reality is that potential home buyers really don't take much time off from searching for their new home. In the graphics below you will see that actually the weekend after Thanksgiving and the week between Christmas and New Year's are some of the best times during the year to have your home for sale and online. 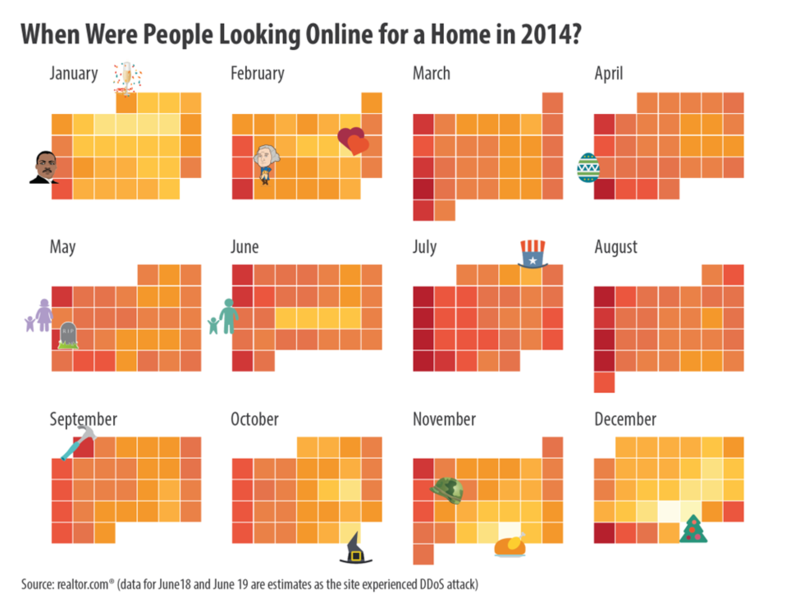 In the following graphic, Realtor.com looked at home search traffic and compared it to average traffic for the rest of the year. They found that people are off work and looking for their 'Dream Home'. I have been in the business for 35 years and have always maintained that if I had to be on 'Open House' only one weekend of the year, it would be the first weekend after the Christmas Holiday. It turns out I was right as housing's 'Black Friday' in 2014 was December 28th. What are the reason's these times are so good you ask? Most buyers are still on an extended holiday break, and it's a great time to look for there 'New Dream Home' after seeing all their friends new homes at various holiday parties. So if one of your New Year's resolutions is to sell your old home and get into a new home, give me a call and allow me the opportunity to show you my 22 - point marketing plan that is second to none when trying to get maximum exposure for your home. Please don't hesitate to contact me today about any aspect of selling your home or to hear about local market conditions.